When John and Fran Weiss included The Museum of Flight in their wills, they did not realize they would be helping the Museum receive immediate funding as well. But, seeing the Legacy Challenge ad in Aloft magazine, it just clicked. They quickly chose to get on board by letting the Museum know about their gift. “The Legacy Challenge was an easy decision. We had already made the Museum part of our estate plan. It was a simple process to fill out the form and do the notification,” says John. A matching gift of $5,000 has been made in honor of John and Fran from the Legacy Challenge matching pool. They have chosen the Volunteer Program Fund to receive their matching gift. By accepting the Legacy Challenge, John and Fran have also become members of the Eagle Heritage Society—a group of supporters who have included the Museum in their future plans. Both John and Fran are engineers and recent retirees. 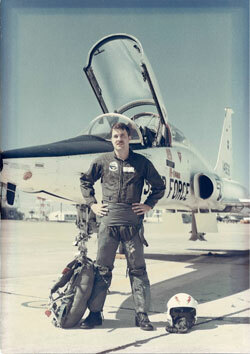 John served with the Navy flying A-4s and A-6s, retiring in 1994. He then flew 747s with Atlas Air. After his second retirement last year, John came to the Museum to work (for free!) as a docent. Fran’s experience in the world of aviation comes from her 32 years as an industrial engineer with FedEx. John and Fran, we salute you. To learn more about including the Museum in your future plans, contact Sandra Dolese, CFRE, CSPG at 206-768-7199 or sdolese@museumofflight.org. 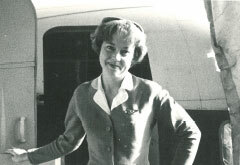 Suzie Jenner had never flown before flying to San Francisco, where she was stationed as a flight attendant for United Airlines. In the 1960s, United Airlines billed itself as "The Extra Care Airline" and depended on its stewardesses (now called flight attendants) to carry out the company's promise. Suzie Jenner was a student at the University of Washington and a graduate of Seattle's Roosevelt High School. She knew she was the girl for the job. Suzie interviewed a stewardess for her high school class assignment and later, as a sophomore at the UW, she applied to be a stewardess herself. She approached airlines whose minimum age was only 20—United Airlines and TWA—and was hired by United. 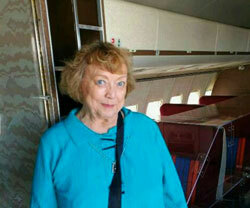 Suzie says, "It was a big deal to have ANY career and to be a stewardess was thought of as being especially glamorous." Stewardess training included how to deliver a baby although only three mid-air births had ever occurred in the history of aviation at the time. Suzie was stationed in San Francisco and took her first flight on a jet to get there. But soon she was flying on both props and jets to New York, Baltimore, Chicago and Denver. United was the first operator of Boeing's 720 jet and also flew the DC-8 and Boeing's 727. Suzie was once a crew member on the Museum’s 727, now on exhibit in the Aviation Pavilion. In addition to serving full meals and beverages, stewardesses also took tickets. 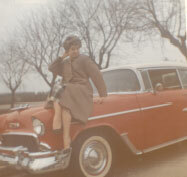 "The passenger was king," remembers Suzie. Celebrities often flew out of San Francisco and one couple, "Mr. and Mrs. Rogers," turned out to be Hollywood stars Roy Rogers and Dale Evans. Suzie also flew on Convair 340 flights from San Francisco to Monterrey taking soldiers bound for war in Vietnam to Fort Ord for basic training. During Suzie's career, United Airlines was the most powerful domestic airline in the United States and had the highest number of passenger-miles of any U.S. airline—beating out American, Eastern and TWA. Suzie attributes the airline's success to "Pat" Patterson, United's president. "He was very respectful, and everyone knew him. He would personally travel as a passenger to check out all the stations." After four years of flying the friendly skies, Suzie "married myself off the job." Stewardesses were not allowed to marry and thus many careers were shortened. The average tenure was 18 months. Suzie continued to work for United Airlines' reservations in Reno, Nevada and remembers, "The Reno Air Races had begun in 1964 and it was the place to be for aviation." 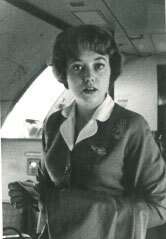 Years later, Suzie became involved with Seattle's chapter of "Clipped Wings," an association of former United Airlines flight attendants or stewardesses. Their name reflects what happened in the days when flight attendants married. Through Clipped Wings, Suzie volunteered at The Museum of Flight when the Red Barn first arrived. She sold "bonds" to raise money for the Museum's B-17 and also became a Museum docent, leading tours and volunteering at Emerald City Flight Fest and the Museum's galas. Suzie's love for The Museum of Flight and aviation continues. "I decided to put the Museum in my Will because I think education and history are important. And not just aviation history. To make a well-rounded person, you need music, art and different experiences. The Museum has all that and more." In addition to providing for her family's future which includes a special needs trust, Suzie has included the Museum in her planning. "My hope is that, through programs like the Challenger Learning Center, the Museum will give people, especially children, the courage to go on and make something big in the world." She wants others to believe that they, too, can become a company president or an astronaut or a commercial airline crew member. To learn how you can help the Museum continue to inspire the children and young adults who visit, contact Sandra Dolese, CFRE, CSPG at sdolese@museumofflight.org or 206-768-7199. Jake Schultz built model aircraft as a kid and was determined to have a career in aviation. He looks back with satisfaction on his involvement with The Museum of Flight, where he will leave a lasting impact for future generations. Jake’s enthusiasm for building and flying model airplanes was encouraged by his father and grew into a love for vintage aircraft. Today, Jake is an expert on the history of the Taylor Aerocar, authoring the 2006 book A Drive in the Clouds:The Story of the Aerocar. Now celebrating its 50th anniversary, the Museum has been part of Jake’s life for 25 years. He helped coordinate Museum public programs from 1999–2000, creating events focused on early aviation and space pioneers.Today, Jake remains involved with The Museum of Flight by serving on the Spaceflight Committee. Jake has a great appreciation for the lasting impact the Museum’s exhibits have on visitors. Over the years, he has donated historic and rare artifacts from his personal collection, some of which are currently on display at the Museum.To provide ongoing maintenance for his donated items, Jake has named The Museum of Flight as beneficiary of his life insurance as part of his estate planning.The idea of continuing to inspire inquisitive minds beyond his lifetime was intriguing to Jake:“I knew I wanted to be a benefactor!” he says. Watching The Museum of Flight grow from its humble beginnings, Jake is eager to see the organization continue to thrive. He may not be around to celebrate the Museum’s 100th anniversary, but he wants young people to be aware of the rich possibilities of the future. By naming The Museum of Flight as a Life Insurance Beneficiary, Jake is helping guarantee future generations the chance to explore their passions for aviation and space. Bill Wilson's gift will go toward Project Welcome Home. As the Vietnam War raged, Bill Wilson graduated from Iowa State University in 1970 with a degree in Aerospace Engineering. He became a pilot in the U.S. Air Force and deployed October, 1972 as an F-111A Pilot/Weapons System Operator with the 429th Tactical Fighter Squadron of the 474th Tactical Fighter Wing. Lt. Wilson flew 34 successful combat missions over Vietnam until he went MIA and evaded capture in the jungle before becoming a POW. The U.S. launched Operation Linebacker II on December 18, 1972, intending to bring North Vietnam to the negotiating table and release the nearly 600 Americans being held as prisoners of war. During the 11-day bombing campaign, more than 1,300 sorties were flown by B-52s, F-4s and F-111s over the Red River Valley near Hanoi. On December 22, Lt. Wilson and Capt. Bob Sponeybarger attacked cargo docks at Hanoi flying at near-supersonic speed only a few hundred feet off the ground. After destroying the target, their F-111's right engine caught fire. Bill remembers, "That's serious at 300 feet, at night. There were a lot of people firing up at us and it was probably a 50mm machine gun that hit us." The two crewmen ejected before the plane crashed in a fiery blaze. Following protocol, they split up and Sponeybarger was captured after two days. Wilson had a .38 revolver, a survival knife, a radio, no food and very little water. He spent Christmas hungry and hiding in enemy territory. Jolly Green Giant helicopters made two unsuccessful attempts to rescue Wilson. He survived five days without food or water before being taken prisoner on December 29 and transported to the Hanoi Hilton. Held captive for 92 days, Wilson and Sponeybarger were evacuated on the last C-141A out of Hanoi on March 29, 1973. The POWs deplaned at Clark Air Force Base in the Philippines and were greeted as American heroes much to Wilson's surprise. Stateside, they were hosted by President Richard Nixon and Henry Kissinger at The White House. 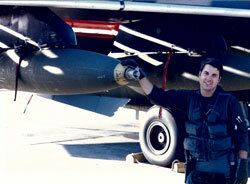 After continuing his service with the US Air Force and Air National Guard, Bill was hired on at Boeing. He was a flight deck design engineer on the first electronic flight instruments and automatic navigation systems in the mid-1980s. 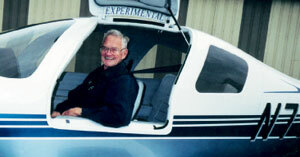 Wilson was lead engineer for cockpit design on the X-32 Joint Strike Fighter Concept Demonstrator and worked on F-22 Raptor Pilot Training Systems. Retiring after 27 years, Bill joined the Museum's docent corps. When not spending time with his wife, Gayle, and the three children and four grandchildren they share, Bill enjoys volunteering as a docent at The Museum of Flight. Bill recently made a tax-wise gift to support Project Welcome Home by making a direct transfer of his IRA's minimum required distribution. "I'm proud of this Museum for building the Vietnam Veterans Memorial Park. It's a nice recognition that many of us didn't receive after the war." To learn more about supporting the Museum with a gift from your IRA, or for help finding the right gift for you, contact Sandra Dolese, CFRE, CSPG at sdolese@museumofflight.org or 206-768-7199. Ron King knew he was an airplane nut at an early age. "I made balsa models of Cubs, WWII Hellcats and Corsairs. I was inspired seeing my first jet bomber, the B-47, flying low over our family farm in Northwest Iowa, trying to fly under the radar toward Offutt Air Force Base," Ron says. "Neither man, child, cow, nor pig knew what to make of it, but I was hooked." Fast forward to Ron studying Aeronautical Engineering at Iowa State University. 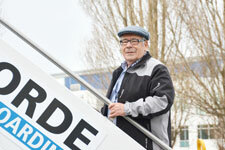 He first worked at Boeing in Seattle as a 20-year-old summer student in 1956 and joined Boeing permanently in 1958. Ron enjoyed a 38-year career with Boeing: 10 years in Aerodynamics, 25 years in Domestic and International Sales, and three years in Technical Services–Customer Services Division. Since retiring in 1996, Ron has continued to join his Boeing colleagues for monthly lunches and occasional rounds of golf. 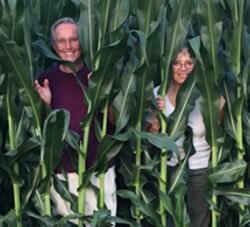 Ron and Clare King grew up on family farms in northwest Iowa and attended one-room country schoolhouses. When their country schools closed, Ron and Clare were each enrolled in the "town" school. That's where they became good friends—and still are, 68 years later. Bellevue, Washington, is home now, but the Kings have returned to Iowa often—sometimes with their kids in tow—to visit family and friends. The Kings' four children and four grandchildren all live in the Puget Sound area. 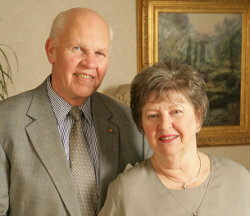 Ron and Clare have been Museum of Flight members and supporters since the campaign to build the Great Gallery in 1984. Some of their favorite projects to expand the Museum have included the Personal Courage Wing and the new Aviation Pavilion. "The Eagle Heritage Society is a great way to make a commitment to the Museum that will reach far into the future, meeting the needs of future generations," says Ron. The Kings are hoping to plant seeds of inspiration as the Museum cultivates new crops of boys and girls. They, too, will grow up hooked on flight. You can follow in the Kings' footsteps and help future generations grow up hooked on flight. Contact Sandra Dolese, CFRE, CSPG at sdolese@museumofflight.org or 206-768-7199 to learn about the many ways you can support the Museum's future with a planned gift. 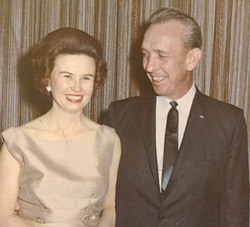 A shared interest in aviation inspired Betty and Sam Houston to name The Museum of Flight as a beneficiary of their estate. Frank “Sam” Houston has a background that can only be described as heroic. He flew many B-17 bombing missions in WWII’s European theater, including seven missions into Berlin, and was awarded the Distinguished Flying Cross (730th Squadron, 45th Bomb Group) for his service. Sam volunteered for the Aphrodite program, a top-secret effort based in England to fly remote-controlled planes, laden with 20,000 pounds of high explosives, into targets near the European coast. This program was a result of intelligence that Germany was developing the V-3, a “supergun” cannon to be used to bombard London from northern France. The Aphrodite aircraft were very dangerous. The two crewman on board had to bail out at 1,000 feet after the airplane was put on course near another controlling aircraft. The Aphrodite program was eventually cancelled, but it helped lay the technical framework for today’s remote-controlled unmanned aerial vehicles (UAVs). Sam’s bravery was evident as many pilots were lost because the airplanes would sometimes prematurely detonate before the crew could bail out. One of those was a Navy pilot flying a Pb4Y on Aug. 12, 1944: Joe Kennedy, Jr.
After serving his country, Sam met his bride-to-be in Spokane, Washington. They moved to Seattle, where Betty held two full-time jobs while he looked for work. Betty’s nights were spent at Northwest Airlines as one of only eight reservationists booking tickets for NWA passengers. During the day, she worked at Bon Marché in the menswear department. When Betty was young, she took flying lessons but could not afford to get her license. She also could not afford to attend college and felt her career was limited because she was a woman. Sam became a pilot for Northwest Airlines and flew mostly 747s for more than 30 years. In 1982, Betty hosted his retirement party in The Museum of Flight’s Red Barn before the T.A. Wilson Great Gallery was built. That same year, Sam became a Museum trustee, serving until 1986. Betty and Sam enjoyed many friendships throughout the world. Although the couple had no children of their own, Betty helped bring orphans to the U.S. from Asian countries after she retired from Northwest Airlines. The Houstons made plans in their will for The Museum of Flight to be the residual beneficiary of their estate. The Museum would receive the remainder, what was left after providing for other beneficiaries. Sam passed away in 2002 and Betty made sure their updated will honored the wishes they had agreed on together. Through their planned giving, Betty and Sam chose to provide educational funding and flying lessons, and to give young women the opportunities that Betty was not afforded. They also wanted to support the Museum’s B-17. 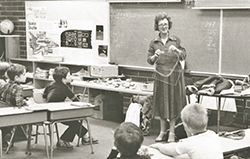 The Frank “Sam” and Betty Houston Education Endowment was established at the Museum after Betty’s passing. The endowment will provide increased educational opportunities and will encourage young women to explore aerospace careers. The Houston’s dreams and passion for aviation will live on for generations to come. A future gift to The Museum of Flight can benefit our services and educational programs for generations to come. 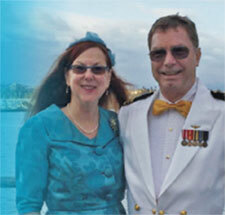 Contact Sandra Dolese, CFRE, CSPG at sdolese@museumofflight.org or 206-768-7199 to learn more. When Boeing's Red Barn was barged up the Duwamish River in 1975, The Museum of Flight had not yet been "born." Its predecessor, the Pacific Northwest Aviation Historical Foundation, with exhibits at the Seattle Center, had secured the new location at Boeing Field. This would eventually become The Museum of Flight with the Red Barn as its anchor building. Herb Bone joined PNAHF as a member in 1974. By the time restoration of the Red Barn began in 1980, a youth education program had been introduced by Georgia Franklin, one of the Museum's first staff members. Georgia took aviation and aerospace programs to schools and also visited adult groups to encourage support for the planned aviation museum. After presenting to the Marymoor R/C Club, Georgia led club members, including Herb, on a tour of the Red Barn with its exhibits still under construction. Herb was captivated by the vision of expanding the Museum's facilities and programs. When the Red Barn opened to the public in 1983, plans were already in place for the "Great Gallery." Herb generously donated shares of appreciated stock in The Boeing Co. to the Phase II Capital Campaign. Today, on special occasions, Herb wears the square red lapel pin given to donors of that historic campaign. After graduating from Carnegie Institute of Technology (now Carnegie Mellon University) in 1951, Herb began his career with the Glen L. Martin Company in Baltimore (now Lockheed Martin). As an engineer specializing in hydraulics, Herb's design jobs involved equipment operating with some type of fluid: jet fuel, rocket propellants, thick oils, or aircraft hydraulic fluid. In 1964, he and fellow engineer Gordon Sholes invented and proposed a unique system for use by NASA: a special hydraulic and pneumatic support system used in testing the 6-million-pound Saturn V Moon Rocket. Shortly after that project, Herb was "loaned" to The Boeing Company for the SST program. He stayed on with Boeing and became a lead engineer with hydraulic flight control. Retiring in 1992, Herb had worked primarily on the Boeing SST, 747-SP, 747-400, 767 and 777 projects. 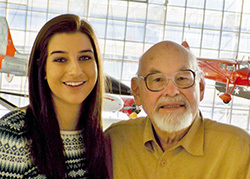 Herb began volunteering with The Museum of Flight three months after retiring. In addition to teaching school programs, he worked on projects for the education department and the exhibits department. He served as chairman of the Museum's Docent Leadership Council in 1998, 1999 and 2001. When Herb retired in 2006 from his active docent role, he had amassed more than 3,000 volunteer hours. In 2001, when the Champlin Collection of historic military aircraft joined the Museum's collection, Herb supported the campaign to build the J. Elroy McCaw Personal Courage Wing. Once again, he donated Boeing stock to the Sky Without Limits capital campaign. Today, when Herb brings his family and friends to the Museum he proudly escorts them through the galleries and exhibits he knows so well. Herb feels that everyone should come see The Museum of Flight and "be willing and anxious to help make it better." Herb recently donated more Boeing stock to the Museum, this time in honor of someone he credits with promoting the Museum in the early years. The note of thanks he received said: "Wanted you to know how much it meant to me. Have been away from there a long time but I poured my heart and soul into that facility. Thank you so much for thinking of me. Sincerely, Georgia Franklin." A thoughtful tribute to how it all began. Donating securities is one many ways to create a legacy of support for The Museum. Contact Sandra Dolese, CFRE, CSPG at 206-768-7199 or sdolese@museumofflight.org to learn how to support The Museum of Flight. Greg Walker's first flights were in an old wooden-winged Bellanca with a triple-tail. He was eight years old and flying with his father, who was taking lessons in Tallahassee, Florida. After moving to California with a degree in finance, Greg worked for a refrigerated airfreight company and was president of Spirit Airways, a helicopter airline. Eventually, he would return to finance and work as a mortgage broker until retiring in 2007. Greg earned his private pilot's license in 1977, received training in aerobatics, and flew his Cessna 172 for several years. As president of the California Aviation Council, he met Lew Wallick in 1979 at a Merced, California, fly-in. Lew was piloting a P-12 that is now on display in the Museum's T.A. Wilson Great Gallery. The P-12, flown by greats like Lew Wallick, Bob Mucklestone and Orville Tosch, is still Greg's favorite aircraft. One of the proud owners – S. L. Wallick, Jr. When he saw the plane on display at the Museum, Greg was reminded of the terrific people he met thru aviation. Since his first visit in 1995, Greg has returned to The Museum of Flight almost every year. "The Museum is a beautiful venue with a great collection of planes and artifacts, but there's more to it than the displays. I like the educational aspect and how the new Raisbeck Aviation High School helps cap that," Greg says. "The Museum continues to fascinate not by just displaying old metal, but by showing the story of flight. We must stimulate the curiosity of the public into understanding the need for a good education and what it can lead to." "My visits there have been memories never to be forgotten. I'm very proud to be a supporter. As a friend once said, ‘pick something and support it well. You can't support 25 things well,'" Greg says. When Greg received a message from former Boeing test pilot Brien Wygle on behalf of the Museum, it started him thinking about greater participation in the Museum's future. "The fact that I'm able to designate a portion of my IRA to The Museum of Flight, I feel, is a good use of funds. If we could get more people to do the same, think of what could be built," Greg says. Marlene Taylor Houtchens was on staff with The Boeing Company for 39 years. 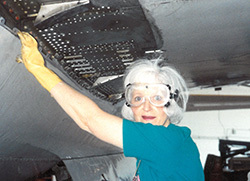 She continued her love for Boeing's B-29 when she signed on with the volunteer crew to refurbish the "Fifi" B-29 in the early 1990s. Her late husband, Lowell Houtchens, had an interesting career experience with the B-29. He was a Boeing field service representative assigned to the Marianas assisting with military operations of the B-29s. As it turned out, he was on the island of Tinian when the historic B-29 Enola Gay took off from there to drop the atomic bomb on Hiroshima, effectively ending World War II. After Lowell's retirement in 1987 after 46 years with Boeing, he and Marlene were actively involved with The Museum of Flight's B-29 Superfortress T-Square54 restoration project until his passing in 2000. Lowell was a charter member of the Museum, joining in 1985. His many volunteer hours earned him the prestigious Lifetime Volunteer Barnstormer membership. Marlene's dreams and donations continue toward making sure that T-Square will be proudly displayed and under cover at the Museum. For more than 20 years, she has enthusiastically supported the Museum's B-29 project with her time and contributions. Marlene still volunteers regularly at the Museum. Her support of the "care and maintenance" of T-Square got a boost recently when she directed the proceeds from the sale of real estate to a charitable gift annuity. Marlene will receive quarterly payments for life, and her capital gains tax from the sale will be significantly offset by her charitable gift deduction. "I'm happy to invest that money with the Museum to make sure T-Square is taken care of for the future," Marlene says. Doug DeVries didn't initially dream of becoming a pilot, but he spent much of his adventurous and curious youth taking apart, rebuilding and making better just about anything he could get his hands on. Fast forward to present, and Doug has not only became a pilot, but he and wife Robbi have explored the globe - from Australia to the Artic to Africa - in their rebuilt 1942 Stearman and 1955 de Havilland Beaver. Both planes were rebuilt by Doug, fueled by his passion and curiosity. After he watched his father battle ALS ("Lou Gehrig's disease"), Doug's desire to make things better guided him to develop a portable life-support ventilator. Robbi also devoted her early career to healthcare, working as a coronary nurse. Together, they founded Pulmonetic Systems in 1997 and created the LTV, a portable ventilator that improved the quality of life for thousands of patients, including actor Christopher Reeves. When Doug and Robbi sold the company in 2006, they had a substantial appreciated stock tax liability to mitigate as well as longstanding philanthropic desires to fulfill. Doug was newly involved as a Trustee at The Museum of Flight, so Robbi and he conferred with their professional advisors and decided to transfer part of that stock into a Charitable Remainder Trust (CRT). The CRT enabled the DeVrieses to sell the stock without payment of capital gains, enjoy a significant tax deduction, receive a lifetime income stream, and provide a deferred gift to The Museum of Flight to establish "The Douglas and Robbi DeVries Endowed Fund" at the end of their lives. The Charitable Remainder Trust perfectly combined their desire to take care of their tax needs while creating a meaningful philanthropic legacy. Don't forget to say thank you to Robbi and Doug next time you see them. Robbi and her Seattle Children's Hospital's Festival of Trees crew decorate the Museum's tree every December, while Santa is delivered by Doug in his de Havilland Beaver! Born and raised in Seattle, Richard Arensberg was fascinated with aviation from a young age. He lived in awe of his older brother, who joined the Army Air Corps in World War II. As he grew, so did his passion for aviation: Richard eventually graduated from model-building to flying lessons. Richard continues to engage his passion by volunteering in the Museum's Air Park, where he often greets international visitors in their native language with phrases learned traveling with his wife, Dianne. Richard and Dianne just celebrated 52 years of marriage. Dianne knows how much Richard enjoys volunteering at the Museum, and she recently surprised him with a birthday party in the View Lounge with their family and friends. 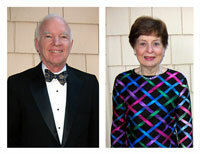 Strong supporters of education, Richard and Dianne are vocal proponents of Seth Margolis, the Museum's education director. "Our education programs are terrific! They just keep getting better and better," Richard says. Richard and Dianne are thrilled with the opening of Raisbeck Aviation High School on the Museum campus. They have contributed to the Museum's endowment and to new exhibits, including the Lockheed Electra 10-E. "We want these programs and exhibits to continue for many years as part of our legacy," Richard says. 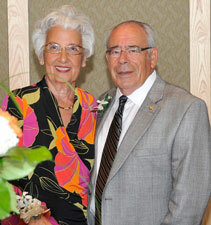 Members of the Eagle Heritage Society, Richard and Dianne enjoy attending the annual luncheons and Museum events. "The Museum of Flight enriches the fabric of our community," Richard says. "We believe it's important to give back." Herman Nickel served in the military for 30 years during World War II, the Korean War and Vietnam. 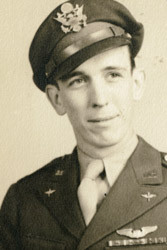 In World War II, he repaired B-29s running bombing missions out of China. 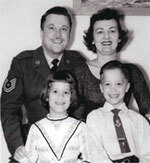 After retiring from the Air Force, Herman and his wife, Cecilia, settled in the Puget Sound area with their two children. Herman held civilian jobs in retirement and was a founding investor in a Washington winery. Cecilia supported Herman as he served with the Air Force all over the world, making her an unsung hero in his eyes. Although Cecilia passed away in 2001, after 55 years of marriage, Herman continues to honor her memory with tribute gifts. Herman is listed on the Military Wall of Honor in the J. Elroy McCaw Personal Courage Wing. His estate plan includes a bequest to the Museum's endowment. 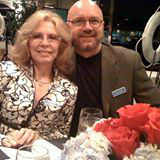 In 2011, Herman established a charitable gift annuity with The Museum of Flight. "My CGA pays me for doing something good!" he says. Herman receives his quarterly tax-wise payment of 8.9 percent for life. When my wife, Marji, and I recently reviewed our estate plan, we decided that after providing for our daughters the rest should go toward the things we care about most deeply. We agreed to add the Museum of Flight to our will and became members of the Eagle Heritage Society. I have been a Docent with the Museum for 15 years and have been involved in a number of museum activities including serving as chair of the Docent Leadership Council and the Docent Training Program. I enjoy sharing the stories of aviation with visitors from around the world and seeing the faces of young and old light up with fascination. One of my favorite areas of interest in the Museum is the Personal Courage Wing. Marji and I believe there is no more fitting legacy than helping perpetuate the Museum of Flight experience for generations to come. We appreciate the way the Museum is preserving the history of flight, keeping the memories of our heroes alive and inspiring future innovators. Every year the Museum presents amazing programs and acquires important artifacts to stay current in this fascinating and ever-evolving field. We know that when our money is given to the Museum it will be used to inspire future generations and keep the dream of flight alive. By Peter N. Jansen Jr.
My father, Peter Jansen Sr., was an aviation pioneer, head of the manufacturing team for the Curtiss NC-4, the first plane to cross the Atlantic in 1919. He began building Curtiss Jennys in 1917 and retired from Curtiss-Wright after 30 years. He ended his career at Boeing in 1969. I followed in the family tradition and worked at Boeing for 35 years in engineering operations, marketing, planning and procurement. I was involved in the defense and space group that developed the B-52, AWACS, SRAM, Peace Keeper, Peace Shield and Minute Man. I worked with space projects Dynasoar and Saturn, the launch vehicle for Apollo. In 1992, I retired and began my "second career" as a docent with The Museum of Flight. You can find me at the museum on Wednesday afternoons, talking with visitors and leading tours. I have included the museum in my estate planning and I'm a member of the Eagle Heritage Society. A charitable gift annuity with the museum provides me with payments for life and supports my charitable goals, too. I believe strongly that a healthy endowment is the museum's foundation, the base on which the future of the museum will grow. I like knowing that my endowment gifts will help provide parts and tools for the museum's restoration projects and give shelter to the volunteers and their work. I'm proud to be part of The Museum of Flight's future, telling the history of flight for generations to come. After all, aviation is part of my heritage. I hope others will join me in supporting The Museum of Flight in perpetuity. When T.A. Wilson, president of The Boeing Company, called on his managers to help support The Museum of Flight's building project in 1984, Dr. Ulf Goranson gladly pitched in. Today, Ulf and his wife, Inger, have remained strong supporters of The Museum of Flight and have included the organization in their will. They had married in Stockholm, Sweden, where Ulf earned a Masters of Science in aeronautical engineering. He also received his doctorate at the Royal Institute of Technology in Stockholm, addressing cyclic load temperature effects on structural fatigue. A talented linguist, Inger graduated from Paris-Sorbonne University and the University of Stockholm. She worked with international corporations as a correspondent in Swedish, English, German and French. The Goransons moved to the U.S. in 1967 with their young children, Peter and Marie, and in1973, each member of the family became a U.S. citizen. Ulf's career at Boeing began with the Supersonic Transport Program, after which he directed efforts to develop the Damage Tolerance Rating System. This system is still used worldwide by airlines operating Boeing models 727 through 777. Dr. Ulf Goranson has been a passionate Museum supporter since 1984. Over the years, Ulf represented Boeing as chair of several joint committees that addressed airworthiness issues for new and aging jet transports. He also made presentations to the White House Commission on Aviation Safety. In 1990, Ulf was one of the first engineers appointed to Boeing Senior Technical Fellows, and was recognized for his contributions to the durability and damage tolerance technology for commercial jets. After retiring from Boeing in 2001, Ulf joined NASA's Aerospace Safety and Advisory Panel, where he worked to assess the safety of the space shuttle and the International Space Station. It's no surprise that Ulf is partial to the Museum's Charles Simonyi Space Gallery and the Museum's Full Fuselage Trainer. The WWII exhibits in the J. Elroy McCaw Personal Courage Wing are also his favorites, along with aircrafts designed by Kelly Johnson, including the SR-71 Blackbird. Both Ulf and Inger enjoy attending Museum events and are enthusiastic about the Museum's recognition as a world-class institution. 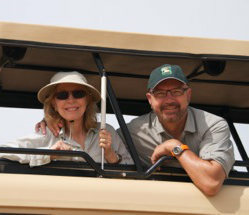 Ulf and Inger are experienced travelers, taking many business and leisure trips during their 54 years of marriage. Ulf has been a licensed pilot since 1961, and completed ten cross-country trips in his single engine plane to the American and Canadian Arctic, Greenland, and Russia. During Ulf's career with Boeing, Inger worked part-time as a multilingual interpreter at the Seattle Tacoma International Airport and a multilingual tour director with Holland America cruises. In addition to being Charter Members of the Museum, the Goransons joined the Eagle Heritage Society ten years ago by updating their will to include The Museum of Flight among their beneficiaries. Ulf and Inger know their planned gift will help preserve aviation history and educate a new generation of aviators and aeronautics professionals. They are proud to be part of Boeing's “dream team” that T.A. Wilson called on to expand the Museum all those years ago. Contact Sandra Dolese, CFRE, CSPG at 206-768-7199 or sdolese@museumofflight.org to learn more about how planned gifts can benefit you and The Museum of Flight. It would be our pleasure to help you create an impactful charitable legacy through gifts to the Museum. Visit www.museumofflight.org/giving/ for more information today. Mark Kirchner loved to fly and so did his fiancée, Mary Lu. On their dates, he took her stunt flying in his Timm, an open cockpit WWII trainer. It was the perfect way to win her heart. 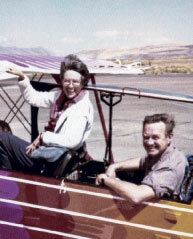 Mary Lu and Mark were married and continued to fly together for the next 53 years. “Airplanes have always fascinated me, but of course Mark only added to that fascination,” remembers Mary Lu. 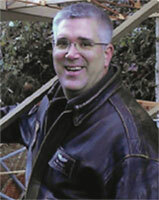 Mark had his master’s degree in aeronautical engineering from MIT, and was an engineer at The Boeing Company. He retired in 1988 as director of engineering technology for the commercial airplane group after a 39-year career. 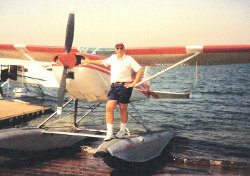 Mark was licensed to fly airplanes, gliders and helicopters. 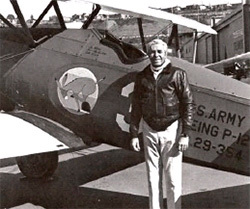 He and nine other Boeing employees built a stunt biplane that is still flown today. The Kirchners in Christen Eagle II homebuilt. Boeing took the Kirchners to Pennsylvania for seven years, and it was there that Mary Lu earned her pilot’s license and flew their Beechcraft Bonanza. She learned aerobatics—barrel roll, snap roll and loop—in a Christen Eagle biplane. She was pilot in command on their six cross-country flights from Philadelphia to Seattle. After moving back to Seattle, both Mark and Mary Lu were active in the community. In 1987, Mark became a trustee of The Museum of Flight and was chairman of the board from 1997 to 1999. Mary Lu was a partner in an art gallery and continued to volunteer at their church. After retirement, Mark built a high-performance Lancair plane in the family’s basement and enlisted the help of friends, family and his favorite co-pilot, Mary Lu. The Kirchners made provisions for The Museum of Flight in their estate planning and are founding members of the Eagle Heritage Society. Although Mark passed away in 2010, Mary Lu continues their tradition of involvement with the Museum. Her recent support of the Inspiration Begins Here! Campaign is in honor of Mark, recognizing his Boeing career on the Boeing Centennial Honor Wall. Their shared love for aviation will last forever at The Museum of Flight.